The third South African AIDS Conference, which took place June 5-8, marked a major turning point in the country's effort to minimize the spread of H.I.V. and reduce deaths from AIDS. According to various news and organizational reports, this conference included the active participation of public, private, and civil society stakeholders. The conference themes also reflected the input of organizations and individuals that had been at loggerheads with the South African government. Mark Heywood, a foremost AIDS activist, long at odds with the government's policy on H.I.V./AIDS, is now the newly elected deputy chair of the South African National AIDS Council. The deputy president of South Africa, Phumzile Mlambo-Ngcuka continues to provide steady leadership as the chair of the National AIDS Council. This coming together and unity of purpose could not have come at a better time in the fight against H.I.V./AIDS in South Africa as well as in the entire continent. South Africa is in the throes of a major epidemic. At least 5.54 million South Africans live with H.I.V./AIDS. Only India has a higher number of individuals living with H.I.V./AIDS in the world. In some urban centers of South Africa, H.I.V. prevalence rates of 29 or 33 percent are known. However, South Africa is one the few African countries that can mount a homegrown comprehensive challenge on H.I.V./AIDS for three major reasons. First, South Africa has sufficient numbers of health workers, despite the uneven distribution of these health workers between urban and rural areas and public and private sectors. Although 80 percent of the population utilizes public sector health services, 64 percent of the doctors and 58 percent of all nurses work in the private sector. In this regard, the government must now face the major task of figuring out how to realign the current disproportionate situation. Second, South Africa is one of the few countries in Africa that can significantly finance a comprehensive H.I.V. prevention and AIDS treatment program targeting millions of individuals. 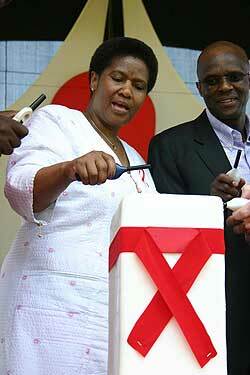 The new South Africa National Strategic Plan on H.I.V./AIDS has an estimated budget of $6.1 billion. The new plan seeks to reduce new H.I.V. infections by 50 percent and is targeting treatment to at least 80 percent of the 500,000 individuals that qualify for antiretroviral therapy by 2010. Third, the government of South Africa has a well-deserved reputation for governance, accountability and the rule of law, despite inevitable ups and downs. In the fight against H.I.V./AIDS, accountability and transparency are as important as financial and technical resources. In this regard, the government of South Africa under Nelson Mandela (1994-1999), and, now Thabo Mbeki (1999- ) has made significant strides. It is a welcome development that South Africa is now poised to provide leadership on H.I.V./AIDS remedial efforts in Africa. The South African government faces the challenge of how to meet or exceed the ambitious targets set forth in the new National Strategic Plan. As noted by Peter Piot, the executive director of UNAIDS, for every individual who seeks antiretroviral therapy in South Africa between now and 2010 another five individuals will become infected with H.I.V. during the same period. The task ahead is not easy. Luckily, South Africa has the capacity to respond. The government and people of South Africa are already running what UNAIDS describes as the "world's largest antiretroviral treatment program." Between now and 2010, South Africa will be the cynosure of all eyes as it seeks to provide H.I.V. preventive and AIDS treatment services to those in need.